Bayern Munich will advance into the Champions League knockout rounds atop their group after a wild draw with Ajax today that saw two red cards within eight minutes of each other and four goals after the 82nd minute. 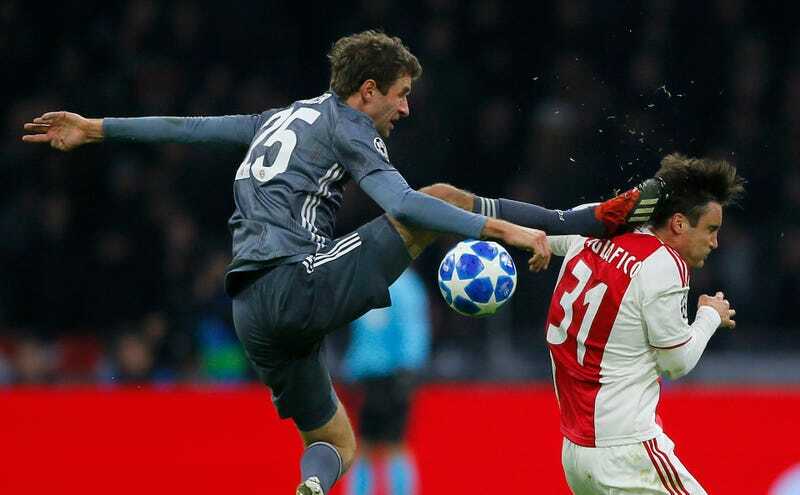 Bayern had to score their equalizing and go-ahead goals without Thomas Müller on the field, since their talismanic forward decided to take an ill-advised (to put it mildly) leap towards the ball and also Ajax defender Nicolas Tagliafico’s head in the 75th minute. Drew McIntyre would be proud.